Schirmer Dentistry in Sarasota, FL offers a range of general and cosmetic dental services to patients of all ages. Dr. David Schirmer has the expertise and knowledge needed to provide every patient with the care they deserve. With a warm and welcoming environment, patients feel comfortable and can ask any questions they may have about their dental treatment. It is suggested that patients should be seen for a dental cleaning and routine exam every 6 months or as recommended by Dr. Schirmer. 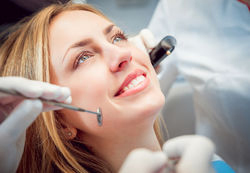 During the cleaning, plaque and calculus will be removed from your teeth leaving behind a bright and polished smile. 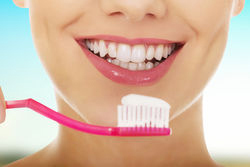 X-rays may need to be taken to help detect possible cavities in between teeth that cannot be seen by the naked eye. In the United States, approximately 25 million adults have obstructive sleep apnea (OSA). This is a chronic condition which causes individuals to stop breathing hundreds of times a night. Sleep apnea occurs when your muscles relax during sleep, allowing soft tissues to collapse and block the airway. This results in breathing pauses, which are followed by brief awakenings that disturb your sleep. Common signs of sleep apnea include gasping, snoring, or choking sounds during sleep. Sleep apnea is more common in men, and having a narrow airway, misaligned jaw and excess body weight all increase risk of sleep apnea. Leaving sleep apnea untreated can raise the risk for serious health problems including high blood pressure, heart disease, chronic acid reflux, stroke, diabetes and erectile dysfunction. There are a range of treatment options for obstructive sleep apnea including oral appliance therapy, CPAP therapy, and surgery. Together, we will help you decide which treatment option best fits your needs and health. Dental implants are one of the best ways to replace missing teeth. It provides patients with a long-lasting result and helps preserve existing bone structure, therefore preventing future tooth loss. A dental implant consists of metal frames or posts which are surgically placed into the bone beneath the gums. Once the posts have been placed, they fuse to the jawbone. Implants can replace one tooth, multiple teeth, or provide a foundation for permanent or removable dentures. Invisalign clear aligners provide patients with a more discreet option for straightening their teeth. Invisalign aligners are made from almost invisible polyurethane plastic and are completely removable. Invisalign systems consist of custom-made aligning trays that gradually straighten teeth. These trays can be removed when eating, brushing your teeth, and for important social occasions. This treatment option can correct a number of malocclusions, but there are still some situations where traditional braces are the better treatment option. Our team will determine which tooth straightening system fits you and your dental health needs. A dental emergency can happen at any time. Pain, swelling, or fracture are reasons to seek care, and we leave time in our schedule each day to help patients who need emergency care. Please call 941-256-3675 so that we may help you. 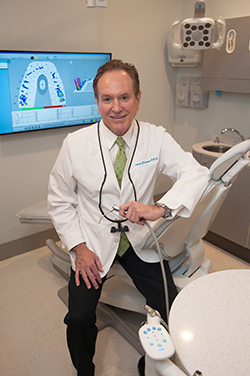 Although Dr. Schirmer is a very experienced general dentist, he knows when a referral to a dental specialist should be made. He works directly with some of Sarasota's finest dental specialists. Should the need arise for specialist treatment or second opinion, you can count on Dr. Schirmer to place you in the hands of a knowledgeable, skillful, and board certified specialist. As well as traditional methods, we also utilize CEREC technology to create and place your crown, onlay, or veneers in one appointment. There are no impressions, temporaries, or second appointment. Your tooth is prepared, and within an hour later, your new restoration is placed. Our patients really appreciate the convenience, comfort and results. Gentler, yet more effective and less time consuming, we utilize the EMS Air Flow Cleaning system for teeth and gingivae(gums). A directed spray of air, water, and glycine crystals are directed to the area to remove biofilm(plaque) and stain. Then piezon energized tips remove calculus (tartar). Studies show that this is an improved method, and our patients prefer it.